With so many apps and portals focusing on off-beat travel experiences, we are spoilt for choice. The latest to join the club is Bengaluru-based Travspire. They promise ‘curated experiences’, like a walking tour of Bengaluru’s historic market centre. “We have a few handcrafted experiences in every destination, developed by us,” says founder Arjun Bhat, who launched the service in February with friends Satya Tammareddy and Ami Naik. The portal offers 20 experiences, categorised into Adventure, Art and Culinary among others, in three states – Goa, Karnataka and Kerala. 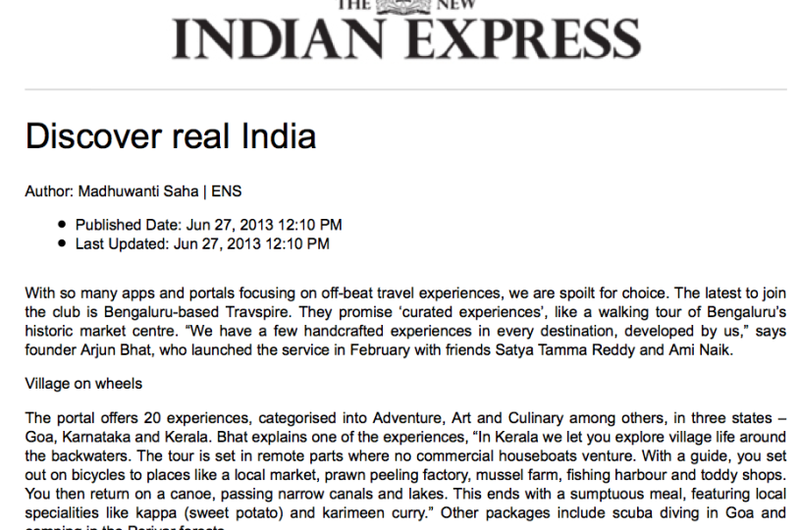 Bhat explains one of the experiences, “In Kerala we let you explore village life around the backwaters. The tour is set in remote parts where no commercial houseboats venture. With a guide, you set out on bicycles to places like a local market, prawn peeling factory, mussel farm, fishing harbour and toddy shops. You then return on a canoe, passing narrow canals and lakes. This ends with a sumptuous meal, featuring local specialities like kappa (sweet potato) and karimeen curry.” Other packages include scuba diving in Goa and camping in the Periyar forests.